This man had the whole plane to himself? When Skirmantas Strimaitis booked a one-way ticket to northern Italy he never imagined he'd be the only passenger on board. 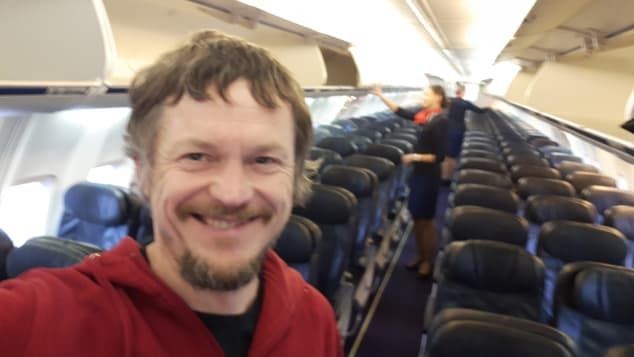 But the Lithuanian national, who was flying from Vilnius to bergamo for a skiing trip in late of march, get shocked when he watch that he was the only passenger of 189 passengers! In the plane, they was only two pilots and five crew members, imagine 5 crew members only for you! Strimaitis suspected something was amiss when he went to check in at Lithuania's Vilnius International Airport and watch a crew member waiting him. After asking why, as he was by no means late, Strimaitis was informed that he was the sole passenger on board. In order to avoid the aircraft coming back empty, one-way tickets were put on sale for the return trip. However, Strimaitis was the only person to buy one. Leading to what he describes as a "unique and unreal" experience. "I was provided with a personal pre-flight safety demonstration. Then I just enjoyed the flight by taking selfies and writing. To have silence on a plane was very unusual. I was smiling all day." He shared a selfie of himself on board the deserted plane during the trip, which lasted around two hours. Strimaitis says the pilot referred to him as "Mr Passenger" while speaking over the tannoy after the plane landed at Orio al Serio International Airport in Bergamo. "The crew said how nice it was to have me on the board," he explains. "I'm sure it was an easy job for them." Of course, that wasn't the first time of a passenger inadvertently getting a unique experience of be the unique passenger in a flight. Meanwhile last year, Beth VerSteeg flew from New York to Washington, D.C. on board a more or less empty aircraft after the unnamed airline apparently mistakenly booked her on a flight intended for staff only. do you want more CURIOUS news? LET US KNOW IN THE COMMENT SECTION BELOW! OF COURSE i want more aviation news! I will do some aviation news as I LOVE aviation. © UpBeat 2019 | V2.1.2 - Designed by Jack. Coded by Jack and Ethan. V2.1.2 - Designed by Jack. Coded by Jack and Ethan.